This intersting photograph of a little narrow gauge 0-4-0st Porter with a train load of phosphate ore in small dump cars is having its portrait made while it waits for its signal to continue to the processing washer plant sometime in the 1890's. Porter built the three foot guage tank engine in July of 1890, for Cameron & Barkley Co., a Charleston, SC machinery dealer specializing in the phosphate and lumber industries. Porter construction number 1195 was purchased by Cameron & Barkley for their client, the Archdale Phosphate Company which was located north of Charleston, SC on the Ashley River. The little 7x12 inch cylinder critter was originally named and lettered "Little Nell", however there is no lettering showing on this photo so the date it was taken may be the later 90's. The engine was certainly returned to Cameron & Barkley after it's duty with Archdale and may have been leased to other phosphate mining and loging clients in the area. By October of 1902 they sold the engine to Southern Iron & Equipment Co. of Atlanta, Georgia, though the details remain murky, some lists show it as #106, while others show #106 as a different engine. 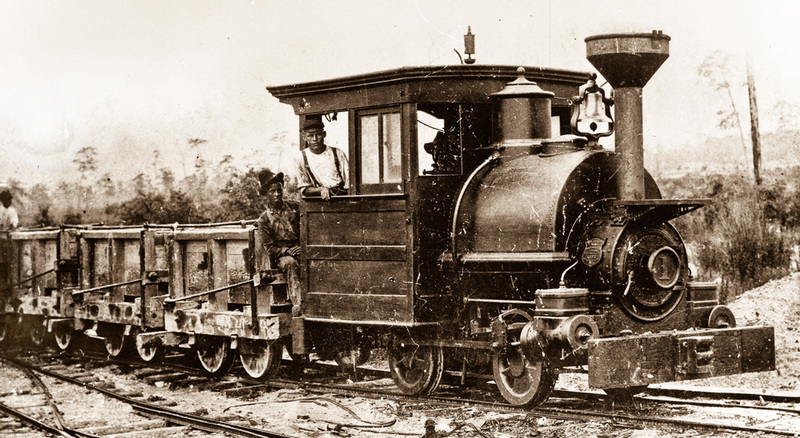 There are many potential buyers for this narrow gauge engine, from the steel industry in Birmingham, the clay industry in middle Georgia or the phoshate industry in Florida, so she would not have set long before being sold.